One week ago, I started serializing my ebook, Comic-Con Heroes: The Fans Who Make the Greatest Show on Earth, which will go into the public domain after the last segment posts on July 8, 2015, after my current commitment for Amazon KDP Select ends. The first installment featured Ken Camarillo, as The Dark Knight. There is no shortage of people like Ken who dress up as someone else during the Con. But the pop-culture event, and others like it, come around just once a year. Some people wear costumes, and assume other personas considerably more often—and that is the case with today’s Comic-Con Hero. She and her wonderful cohorts reach back into the past, recreating in modern times flavors of an era few people remember but should. With that brief introduction, let’s meet The Fighter. Ken Camarillo and I part ways near San Diego Convention Center’s upper terrace that overlooks the bay. I walk outside searching for a food concession. Looking down to the lower mezzanine, I see Medieval knights, dressed in full armor, clashing swords and shields. I certainly hadn’t seen any of them walking around the main exhibit hall. What an odd coincidence this is—to go from Batman, the modern Dark Knight, to those from the Middle Ages. I follow several inside and stop a woman, about 1.6 meters (almost 5 foot 5 inches) tall, as she enters a small room where other people in Medieval garb gather. I ask to interview her. Chaos awaits inside, where past and present collide. I see people wearing T-Shirts and shorts sitting alongside those with armor fittings or Medieval European attire. One maiden knits from a modern handbag, while another woman dressed in full armor listens to music on her iPhone; the white earbuds can’t be missed. Clothes of different vintage and eras are everywhere, in piles on tables, chairs and floor corners. Modern meets Medieval, and the ambiance lifts my mood. What a treasure is this tucked-away place. Strangest of all is the chatter. I could have easily stepped into an ancient English pub for the loud conversation. The talk is festive and ferocious. Kill the fluorescents, light candles and put pints of brew on tables and the atmosphere would be about right for 14th- or 15th-Century Europe—or what I imagine it to be. The woman I interview, Melanie Smith, brings calm to chaos. Talkative but not loud, she wears maroon-and-white Medieval fighter’s uniform, which with armor weighs about 16 kilograms (35 pounds). The helmet alone is 5.5 kilos (12 pounds). We sit and chat, while she eats a contemporary salad. Smith, an accountant, is local, from Escondido, Calif., which is about 48 kilometers north of San Diego. She belongs to the Society for Creative Anachronism, which is “dedicated to researching and recreating the arts and skills of pre-17th-Century Europe. Our ‘Known World’ consists of 19 kingdoms”, according to the organization. “We like to represent the best of the Middle Ages, chivalry being the primary goal”, Smith says. “We also do arts, science—pretty much anything they would have done, we try and recreate. We’ve got sribal arts and illumination, we’ve got fabric weaving, dyeing—she is doing some handwork right now”, referring to the maiden sitting beside me. “We’re here doing recruitment demos; we’re here just about every year”, Smith says in response to my question about why she attends Comic-Con. Sir Patrick O’Malley of Ulidia, as he is known in the Society, comes up behind us. The Duke’s wife, the Duchess Kara the twin of Kelton, organizes the event. I show interest in his chainmail. “That’s Titanium-welded chain”, Smith says. The chainmail weighs 4 kilos (9 pounds)—”the benefit of Titanium over actual period metal, which would be…35 pounds [16 kilos] if he wore the standard ring suit”, she explains. I ask Smith how she got involved in the Society. “My friends took me to a Renaissance fair, and me and my other half thought it was fabulous. We bought clothing. We had such a great time, we came back again”. Then her friends told her “about this ‘other thing we do’. You get to dress up the entire time and go camping essentially for four days in costume, and ‘this is how we live’. So we went, and we really enjoyed it”. But while experiencing the Medieval, on this first expedition Smith was every bit the modern woman. “Primarily at first, all I did was shopping. I shopped and hung out at camp. Then one day I went to help a friend who was water-bearing for the fighters. I had never seen the battlefield before. I spent all day giving water to the hot, sweaty fighters”. Then everything changed. “There was a charge coming down the field coming towards the area I was standing, and my whole body, mindset, everything got down and low and kind of aggressive and went ‘Alright, come on, I can take `em’. That’s where I learned that I love fighting. It was the craziest thing I had ever experienced”. Smith joined the Society in the early 2000s, and “pretty much dropped everything else that I did—gaming, because I was a paper gamer”. She started training as a fighter, for more than eight-and-a-half years so far. “Everything I do now is training for fighting”. Her explanation makes me wonder about role-reversals: “When people think of Comic-Con, they think of all these people dressing up as superheroes”, I tell her. “Everyone is assuming a role, assuming an identity. But I presume yours is different, that you’ve chosen your identity”. She interrupts, “Yes”. I continue: “How do you”—”choose“, she finishes. Smith chose based on her fighter’s regalia. “Where would my armor be placed, because I’m coming from a fighter background. This is what I live in. It’s pretty much 14-Century armor. I looked at names and cultures that would have worn this style of armor”. In the Society, Smith is the Honorable Lady Feia Ambur, from Gotland, which is part of present-day Sweden. “Gotland is in the middle of a trade route, and all cultures would kind of come by it. Because my warband is a Varangian Guard-based warband—Viking, Irish and Rus—it all kind of fit together that way. “I figure if she was the daughter of a trading merchant on Gotland, these are all the peoples she would have encountered and would have been interested taking off with. You’ve got the Rus in that period. You’ve got the Mongol invasion that was pushing everything towards the coast; St. Petersburg, all of that”. Yes, it was a busy era. I must be culturally biased from movies and TV shows depicting knights in England, or France. Sweden surprises me, but someone more knowledgeable, particularly about the Vikings, would know better. During the 9th Century, Vikings invaded parts of Western Russia. “From the name of their state, the Scandinavian incomers were called in the sources Rus or Rhos, a term whose origin is still debated, but Eastern Slavonic and Byzantine sources called these adventurers Varangians”, researcher Raffaele D’Amato explains (The Varangian Guard 988–1453, Osprey Publishing, June 2010, p. 3). The Varangian Guard were elite fighters of their day, and garb and armament reflected mixed cultural influences. “Originally the Guard was drawn primarily from the Rus, but very soon other Scandinavians such as Norwegians, Icelanders, and Swedes joined the ranks; these were followed, in the second half of the 11th Century, by Danes and Englishmen, or Britons of Viking descent” (D’Amato, p. 12). The battle axe was the Guard’s signature armament. Smith has first-hand experience with the risks that Medieval arms pose. During her first engagement, the week-long Estrella War, which the Society’s Kingdom of Atenveldt holds in Arizona, there was an incident. She removes protective gear and shows a scar, “my war wound”, that runs nearly the length of her forearm. “That’s what I brought back”. I express surprise seeing the scar and ask how long it is. “There used to be a seven-inch plate in there”. Smith originally trained for tournaments, “which is a different style than war fighting”. Armament differs, too. The sword is shorter and the shield larger. “I’m standing on the frontline thinking—and that’s part of the problem, you can’t think when you’re fighting—all I have to do is block”. She shifted her shorter sword to where it would be during tournament fighting. Down the field, a fighter came swinging a glaive, which essentially is a sword on a pole, against the shields. The change in position exposed her arm rather than shield. “He broke the ulna”—one of the two bones in the forearm. “I wasn’t even aware. I thought it was a muscle cramp, a charley horse, because that’s what it felt like”. She fell back out of the line, “because technically I wasn’t dead, it wasn’t a kill shot”. Smith sought medical treatment after pain persisted for several hours. She chose surgery over a cast because of the possibility of a future operation. “Because everything I do is fighting, I said: ‘Let’s get it over with’”. I wonder about women fighters in the 14th Century. Were they really so common? “There are some known women fighters, like Joan of Arc”, Smith answers. “A lot of Viking women fought. Most women defended the castle while the men were away. But there’s not a huge lot of historical documentation on it”. Roles varied, depending on culture. Viking women were “viewed as equals. They did fighting as well as the men. Rus women were more towards the property end of things. So I’m a little out of sync there”. 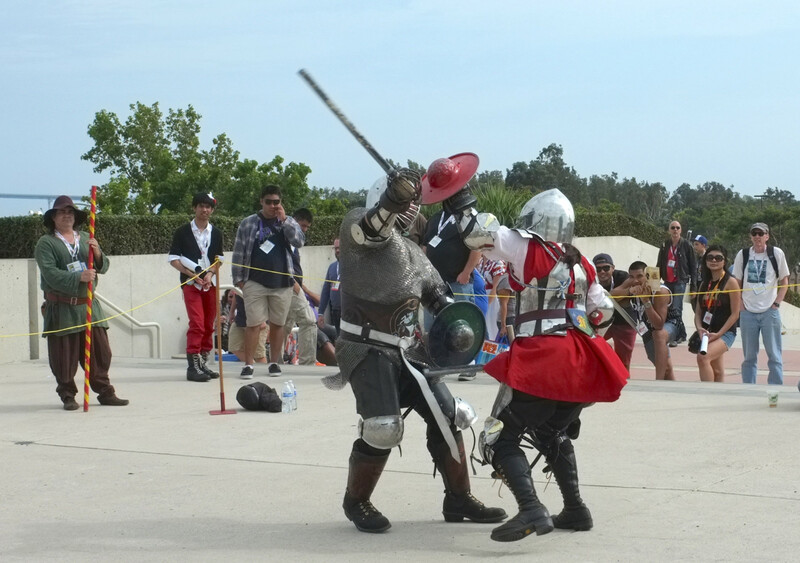 Thirty minutes later, I watch a woman transformed, from Melanie Smith to Feia Ambur, fight in full armor during several bouts on the lower terrace. Her strokes are smooth and use of shield clean, clearly reflexive, as muscle memory does what deliberate thinking can’t: Attack and defend. Despite smaller stature, something she says proves true in combat: “In my mind I’m bigger than most of the guys”.